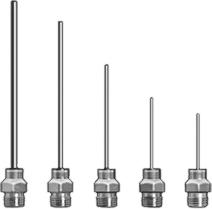 This five-piece needle nozzle kit works with the blowgun air coil hose. The needle nozzles attach to the end of the blowgun and concentrate airflow into a pinpoint. Nozzles have a stainless steel tube and a nickel-plated brass fitting. Set includes tube sizes (Diameter × Length): 0.134" × 2 3/4", 0.095" × 2 15/32", 0.072" × 1 3/4", 0.050" × 1 3/16", and 0.042" × 1 5/16".